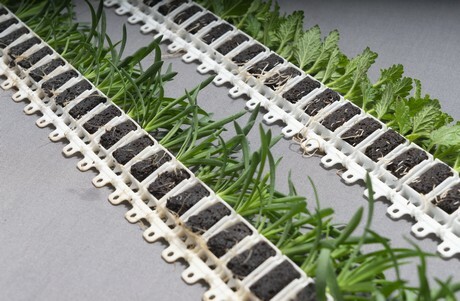 Based on positive experience with numerous commercial deliveries of unrooted cuttings and bare-rooted, substrate-free products in the AutoStix-strip of Visser Horti Systems to customers in North America, Selecta One now goes one step ahead with an innovative development for the European market. Selecta One cuttings are sticked and rooted in a multimedia strip in the South. Selecta One will distribute this innovation under the product name "ROCS“ with their own logo. The name is derived from the term 'Rooted Cutting System‘. ROCS is a rooted cutting in a substrate in a strip, and processing can be completely automated. "ROCS is a forward-looking technology in young plant production and processing. ROCS will change the green industry and offers significant advantages for the whole supply chain from the breeder and producer of young plants to our customers in view of flexibility, effective workload and plant quality. Our know-how in young plant production and Visser‘s latest technologies in production machines combine two decisive success factors“, says Stefan Reiner, head of product development at Selecta One.